Blue Jeans. White One X. Put you in my pants, you know you made my phone stained. It was like, Papa Smurf, for sure. You're so blue to death and sick as ca-cancer. Ahem. Or something like that. 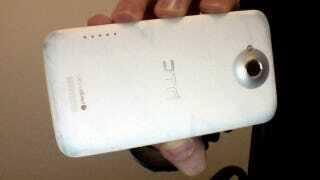 A user found out that when he put his white HTC One X in his jean pocket, the indigo dye stained his phone. Gross.